GJX features over 650 booths of U.S. and international wholesale dealers of Diamonds, colored gemstones, Pearls, fine jewelry, fashion jewelry, gem carvings, findings and lapidary equipment. A & D Gem Corp.
Blue Gems & Beads, Inc.
Blue Star Gems (Thailand) Co. Ltd. Bright Future Gems Co. Ltd. Bright Gems Intl (Pvt) Ltd. Bright Star Diamond USA, Inc.
Cody Opal (Australia) Pty. Ltd.
Colgem El Ltd. - Coldiam Ltd.
E & E Gemas Ltda. Galaxy USA, Inc./Key Items, Inc.
Gem Stone USA/Forever Jewels, Inc.
JP Intl. 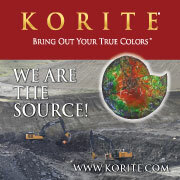 Rough Mining & Colored Gemstones Inc.
Keywest Color Stone Chain, Inc. Nature de Colours Co., Inc.
New World Gems Co., Ltd.
Niva Comercial Exp. e Imp. Ltda. Opals by Emmanuel Christianos Pty. Ltd.
Patel Gems (Thailand) Co., Ltd. Pillar & Stone International, Inc.
Primus Jewels / Right Gems, Inc.
RMC Gems Thai Co., Ltd. Rough & Ready Gems, Inc.
San Wai Gems & Jewellery Fty. USA Co., Ltd.
Shenzhen Minglan Jewellery Co., Ltd.
Shenzhen Olivine Ind. Co., Ltd.
SS Agencies (1998) Co. Ltd.
Stone World Ind. Imp. Exp. Ltda. Thai Gem Centre Co., Ltd. Try Once Gems & Jewelry Co.
United Colour Stone Co. Ltd.
Visaka Gems & Jewellery, Ltd.